Talk to your vet about helping your kitty's joints with glucosamine. Glucosamine is a compound that occurs naturally in joints. Given as a supplement, it can aid joint comfort and function. If your kitty suffers from joint degeneration, glucosamine supplements may be beneficial. 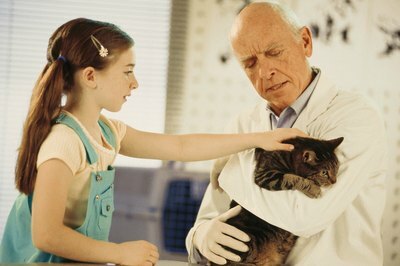 Always consult your veterinarian before giving your pet any supplement. Your kitty's body produces glucosamine, but production decreases as she ages. This contributes to the degradation of her joints, and it's why your vet may suggest a supplement. The most common source of the glucosamine in supplements your kitty can take is crustacean shells. The compound is highly concentrated in these shells, and since so many are regularly discarded, the source is readily and cheaply available. If your kitty is elderly or if she suffers from arthritis, hip dysplasia or another degenerative joint condition, this compound may help. Extra glucosamine is often effective at slowing cartilage breakdown and even rebuilding lost cartilage. As cartilage is worn away, friction between bones increases, causing pain. This pain can keep your kitty from moving around well. Glucosamine may help keep her mobile in the face of aging or joint disease. Comfortable mobility is important for your furry friend's quality of life, and it helps keep her at a healthy weight and otherwise feeling her best. Because glucosamine is a natural compound that the feline body produces on its own, it's generally safe for your kitty. Still, safe use requires clearance from your vet and following his instructions, as well as all manufacturer directions. Serious side effects are all but unheard of, and minor side effects are rare. They might include some diarrhea, vomiting or digestive discomfort. These can be expected to go away after a few administrations; a lower dose might also help. Some caution is needed if your kitty is diabetic, as glucosamine supplements can contribute to elevated blood glucose levels. If you notice any adverse effects in your kitty, consult your vet. Many joint supplements containing glucosamine are available for your kitty. Some contain other ingredients that also support joint function. A compound called chondroitin is often paired with glucosamine. Omega-3 fatty acids are another common ingredient in joint supplements, as they soothe joint inflammation. You might also see the mineral manganese or the chemical methylsulfonylmethane, often shortened to MSM. Ask your vet about other potentially beneficial ingredients.